Her first visit was to help set up a village based salon and to teach 2 girls haircutting skills both from the poorest villages on the outskirts of Phnom Penh. Since Jackie’s visit last year the young hairdressers Srey Py and Phara have both qualified and have got jobs in the City. This year Jackie met the mother of Pyra (left) in her village dwelling. Pyras mum is so proud of her daughter who is now able to help support the family. 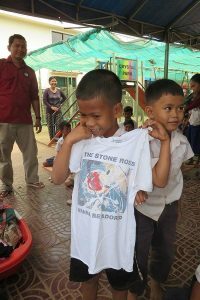 Jackie took many small items of clothing and shoes for the younger children of the school which were handed out on her last day at the centre, as well as providing haircuts for the centre staff and children. 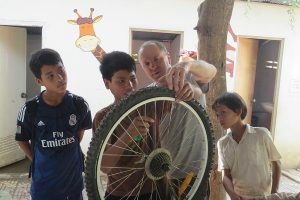 Jackie’s husband Terry accompanied her on this recent trip and trained 2 boys Sing Lee and Sok Long in bike repairs and mechanics.